Our prints are available in a wide variety of sizes and shapes, so the range of sizes here is provided to give a general guide. Every image in our gallery has sizes listed. This page gives an idea of prices and has measurements in imperial and metric sizes. The measurements here are paper sizes, not the printed area of the image on the paper. Let’s say you want a 20″ x 20″ (51cm x 51cm) image – it won’t fit on 19″ x 13″ (48cm x 43cm) nor will it fit on a 25″ x 17″ (63cm x 43 cm) sheet – it will fit on a 24″ x 24″ (61 cm x 61cm) sheet, so that gives the price for your print. You should note that if you are going to have the print matted and framed, you will need a border around the edge – ideally at least an inch (~2.5 cm). We’ve collected together some basic photo framing tips that may be of help. The type of paper we can print on for you can be varied, since a print on a heavy cotton rag art paper will have a quite different feel to one produced on a lustre (or pearl) finish paper. The price list below will help you calculate the cost of our basic fine art prints on paper. Once you have chosen your picture, please email us with the name of the image and the size you need and we will process your order – see below for payment and delivery information. Keith prints his work to your specifications, and your picture will usually be printed and posted within a few days of receiving payment (please note, depending on the type of paper used, we may need to allow a few days for the print to dry before we post it). Our fine art prints are created on a variety of materials and at bespoke sizes for residential and commercial interior design. Some of our images can be licensed for producing very large prints. In some instances we may be able to offer other fine art paper types based on our ongoing research and testing of new print media. By personal cheque – please indicate in your order email if you’d prefer to pay this way. Your print will be sent as soon as your cheque has cleared. Delivery in the UK is £10 (Royal Mail SD) for one or two prints, and an extra £2 per print after that. For sizes above 17″x25″ please contact us directly to arrange shipping or collection. Please contact us directly with your requirements, and ask for a quotation. There are more details of our commercial services are on the Prints for Interior Design page. We have a range of print and pricing options aimed at commercial clients. We are happy to ship overseas – please contact us directly for shipping options and costs to your location. Given shipping costs we would normally only send bare unmounted prints in a shipping tube. 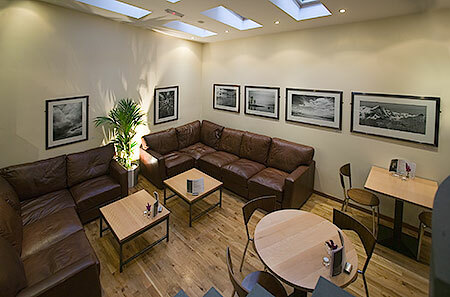 We have examples of our range of large panoramic prints in their own Panoramic gallery. At the right is a picture of Keith holding a 40″x30″ (1020mm x 760mm) print, with a 26″x16″ (660mm x 410mm) framed print on the wall behind him. Our prints are normally shipped unmounted, for you to frame to your requirements. We can however quote for framing, but do appreciate the shipping costs and risks for large pictures. A typical 13″x19″ (33x48cm) landscape print would be mounted in a 20″x24″ frame (50x60cm) and an 8″x11″ print would typically go with a 16″x12″ frame. If you have -any- queries about purchasing prints, mounting etc. — please do call us before ordering prints. Our fine art prints are created on a variety of materials and we can produce Keith’s prints on specialist heavy art papers and in some instances we may be able to offer other fine art paper types based on our ongoing research and testing of new print media. We can also supply bespoke sizes for residential and commercial interior design and some of our images can be licensed for producing as very large prints. Our largest print to date – shown below in exhibition – is over 14 metres long and printed on a gloss finish canvas. We can also provide prints laminated with a protective plastic film, and mounted onto substrates such as Aluminium or Perspex. Please just ask if you want something a bit different. New mounting techniques are appearing all the time and we’re always interested in looking for new ways to display Keith’s images. We do not directly supply framed canvas prints. Canvas is available as an option for our very large images, where we will provide a rolled canvas print to a specialist framer who can stretch it over a frame for you. If you’re interested in a large canvas print, please call to discuss your requirements and we can explain what we can do for you. 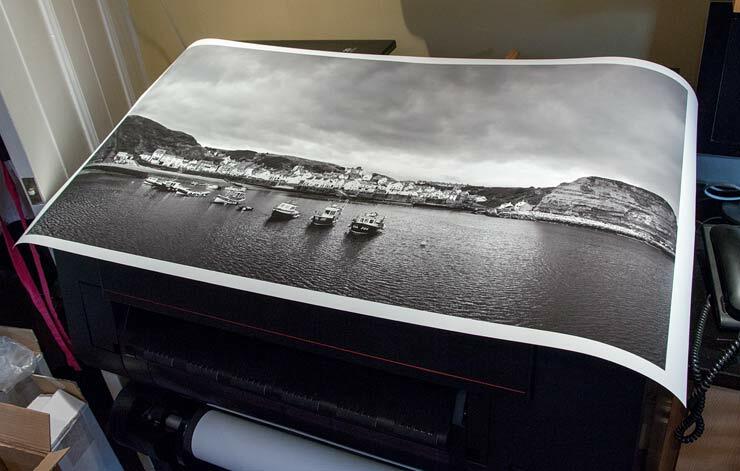 A large black and white print of the harbour at Staithes, on the N. Yorkshire coast. Printed on a heavy archival (acid free, lignin free, OBA free) neutral white rag paper with pigment inks. The print area is 58cm x 110cm, on 61cm (24 inch) width paper. The prints should be kept away from dampness and direct sunlight and mounted behind glass. With the relatively recent ink technology involved we keep archive digital versions of any print produced should there be any longer term quality problems (say after 2-3 years). If you have unusual lighting (certain types of fluorescent are worst) please let us know, since we can allow for this in some circumstances. We’ve rarely had to do this, but it enables us to know that the images are being seen at their best. A custom print, created specifically for the client. The request was for a visually striking image that would fit the location. 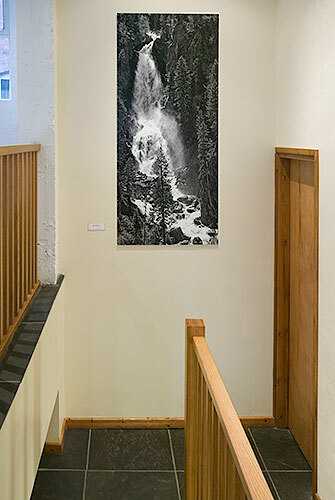 It is on the main staircase leading to and from a restaurant. 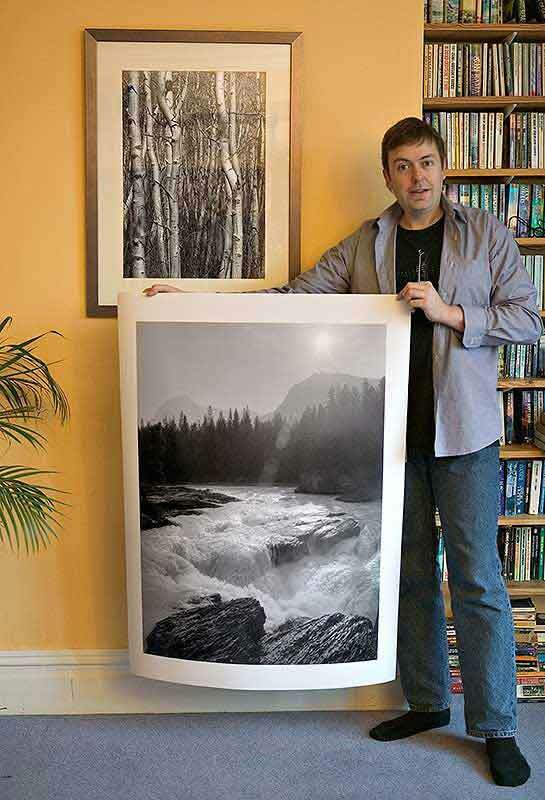 Printed at 64″x30″ (162 cm x 76 cm), the print has been laminated onto a rigid backing.